Drawing inspiration from the world of interior design and architecture our blog is intended to keep you posted on the latest design trends in addition to informing you of innovations within the flooring arena. Pizza Storm is a Pizza restaurant with a twist, customers can create their own personalised pizzas which are ready to eat within 5 minutes thanks to their 900 degree heat ovens. Pandomo Loft provided the ideal flooring solution to compliment the industrial interior design for Storm Pizza UK in their Wandsworth venue. 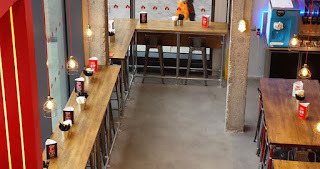 A polished concrete flooring solution combining urban chic with a hard wearing and practical surface.